Bhagawan Baba never advocates giving up one’s duties to pursue a spiritual life. In fact, on several occasions, Swami has strongly reprimanded those that compartmentalise aspects of life as ‘worldly’ and ‘spiritual’. The life-experience of Prof. H.J.Bhagia is a case to point. ‘Hands in society, heads in the forest’ is the motto that Swami advocates. That is one of the reasons why everyone is attracted to Him - everybody is given an equal opportunity to pursue a spiritual life irrespective of vocation or status or any other difference. Bejoy’s perspective of a ‘spiritual life’ had transformed without his knowledge. He now knew that it was no longer essential to ‘sacrifice’ or ‘run away’ from the world to achieve the ultimate. 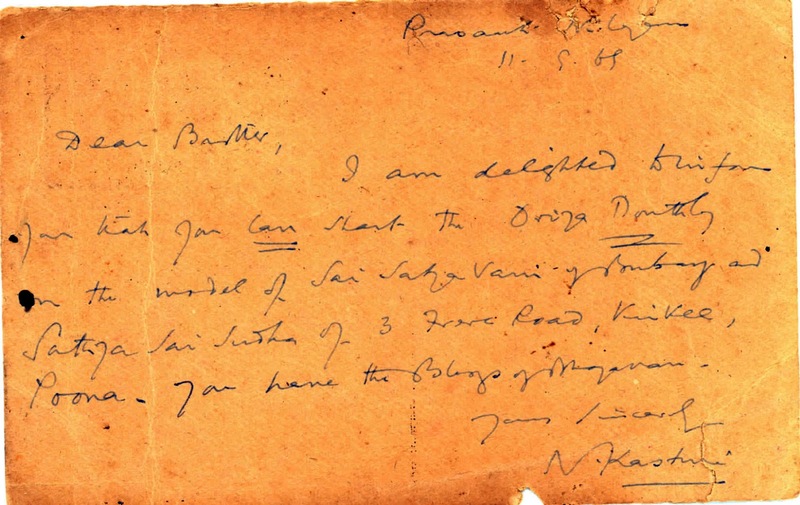 Wiser, he dropped a postcard to his parents informing them in brief of his adventure and whereabouts. Day later, he was accosted by Prof. N. Kasturi who, among his several other duties in the ashram, also served as the postmaster. Two English teachers in a single frame - Bejoy with Prof.N.Kasturi. Thus Bejoy’s needs after the ‘33 Rs’ were also taken care of, by the worldly father this time! He attended his first ever Shivarathri in Prasanthi Nilayam and it was unforgettable. In the morning, he witnessed the spectacle of the Vibhuti Abhishekam. He saw with wonder as Swami swirled His hand in an empty pot upturned over a silver idol of Shirdi Baba and heaps of vibhuti poured out from it. In the evening, he witnessed Swami manifest two lingams from His stomach through His mouth. He clearly saw flashes of light before each of the lingams emerged. It was with thrill and thrall that he boarded the train to take him back to Odisha. He vowed that he would return to Prasanthi Nilayam soon. Thus it was that Bejoy fulfilled Swami’s directive of plunging back into society while his mind and heart continued to remain in the Eden that Prasanthi Nilayam is. Vibhishana understands his mistake. He immediately guides Hanuman to the Ashoka Vatika where Sita is being held captive. Doing whatever one does as an offering to the Lord is one level of devotion. But doing only what pleases Him is a higher level of devotion. It requires us to sacrifice our likes and dislikes to take the Lord’s mission as our own. That is precisely what Bejoy decided to do because he understood that if he loved his Swami, he should do what He loves. This realization came to him as he voraciously devoured all the books, by Swami and on Swami, that he could lay his hands on. 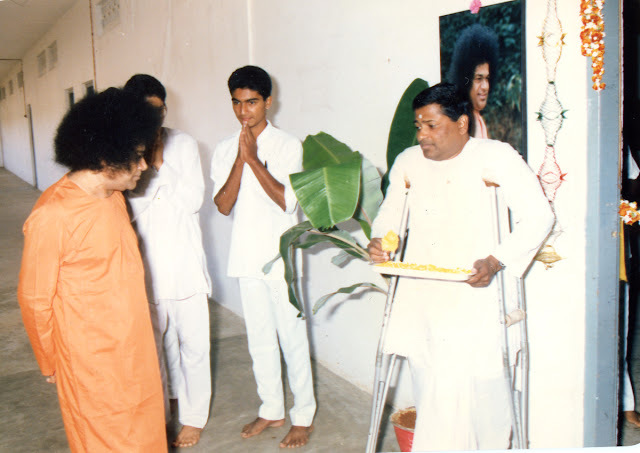 He joined the budding Sri Sathya Sai Seva Organization in the state of Odisha (then called Orissa). And then, he began to contribute. He had read an English monthly by the name “Sai Sathya Vani”, published at Pune. He intended to start a similar monthly in his mother-tongue, Odia. He wrote to the editor of the Sanathana Sarathi, Prof. N. Kasturi in Prasanthi Nilayam expressing his desire. Within a couple of weeks he received a response from him! Swami had blessed his endeavour and he could go ahead with it. 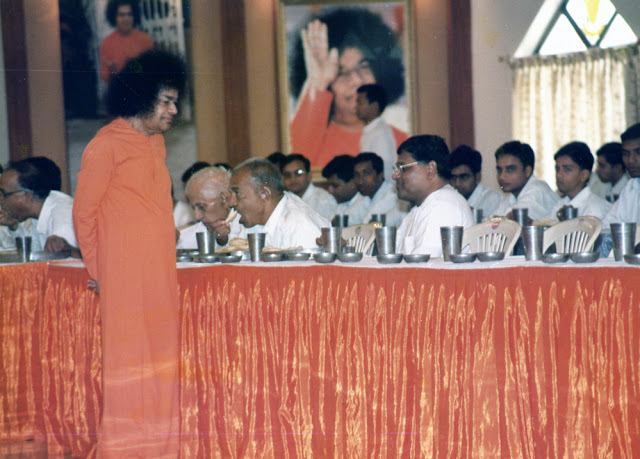 Thus began Bejoy’s journey in spreading Swami’s life and philosophy in all parts of Odisha. College at Cuttack, the printing of the periodical was also shifted to Cuttack. Whether at Bhubhaneswar or Cuttack, his schedule was similar. Bejoy is seated second from left in the last row during this photoshoot at the conclusion of one of the Summer Courses that he attended. A Samithi was started in Cuttack and that only meant more work for Bejoy. He loved doing everything that pleased Swami. He did not want to do anything else. The love and care of his Divine Father showed in Bejoy’s teaching and he became a popular teacher in all the colleges he worked. He was himself amazed at the love and respect he received from the students. Nobody had ever imagined that a person who couldn’t walk normally would be able to conduct classes of more than a hundred students with perfect discipline. Bejoy did it! But then, the strict discipline of his father also showed in his classes. This led him to be disliked by those who disliked discipline. One day, a student for whom he was a favourite teacher during his stint in the Ravenshaw College (1975) approached him in great anxiety. After that, the lad also revealed the names of the students who were planning the attack. Bejoy thanked him, assured him that he would be fine and then sent him away. Back home in his family quarters, Bejoy was lost in thought. Every evening, from that day, Bejoy spent half an hour in a visualization exercise. He would visualize a triangle with Swami at a vertex, himself at the second and the ‘rowdy students’ at the third. Then he imagined the light of love from Swami moved to him. Then, the light travelled to the boys, and from them back to Swami. This process of expanding love gathered speed, and became a fast rotating circle. This circle of love engulfed all, Swami, Bejoy and the misdirected young men. Then where is enmity, where is hate, where is anger and where is fear? “Aha! Why didn’t you go ahead then?”, Bejoy asked with a disarming smile. Bejoy never faced any such attacks in his whole teaching career. More importantly, he got the opportunity to first-hand experience the power of Swami’s words and the power of Love. Nourished by the Lord at all levels - physical, mental and spiritual. 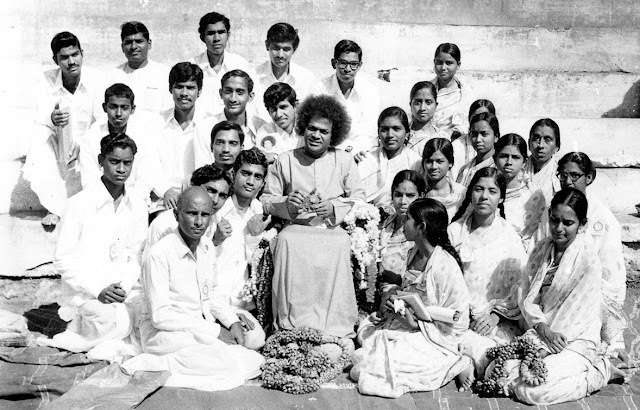 In 1979, Bhagawan Sri Sathya Sai Baba started a junior college at Puttaparthi. That was the time when the Sanathana Sarathi carried a call for applications for the various teaching posts. In 1980, Bejoy applied and was called for the interview. 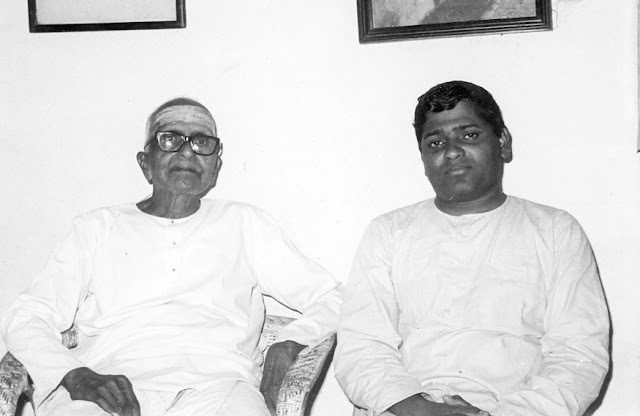 In the interview were two foremost devotees of Swami of that time - Sri Kutumba Rao and Dr. Suri Bhagawantham. Bejoy spoke with the conviction of a man possessed by God in his heart. Swami filled Bejoy's life with plenty of smiles, peace and joy. What more does one need in life? Ah! Those words were the most melodious for Bejoy’s ears. He was overjoyed and immediately made preparations for the shift from Odisha to Andhra; from the land of Jagannath to the land of the omnipresent Jagannath! The salary he received was Rs 800. It would be about a thousand Rupees short of the salary he was receiving at the Ravenshaw college. But for Bejoy, the joy of the Divine appointment was such that he never even thought of worldly disappointment. In his heart he had been ready to do anything for Swami, even for free. Everything was just the love of his Divine Father. He felt safe and secure like never before. And why not? Swami had assuaged any fears that might arise in his heart even before they arose. One example is that of his children’s education. Being a Balvikas Guru trainer for years, Bejoy was aware of the hugely inadequate education imparted to children in schools. He and his wife Arati were were genuinely worried about the education of their two girl kids. But Swami took care of that in a special way. One night, before Bejoy applied for a position in the Junior college at Puttaparthi, his the wife had a dream. Swami asked her to hand over the charge of both daughters to Him. He then held their hands firmly and walked away. That is precisely what happened because, unknown to Bejoy and his wife, Swami had willed the inauguration of the Sri Sathya Sai Primary School the very next year. The school opened in November 1980, and the elder one Nivedita joined it the same year. The second one, Subhashita, came to her sister next June. God do it. Bejoy was working tirelessly for his dear Lord. Couldn’t Swami simply make him whole so that he would be able to serve Him better? The thing is Swami never does anything for Himself. He is selflessness personified. That is why instead of only calling the qualified; He qualifies the called! That is what He did with Bejoy too. We may feel that a weak child warrants a little more attention from Parent. But weakness alone cannot justify a Parent’s attention. A true parent always wants the child to forget his/her weakness, and stand up to his/her potential. That makes the parent proud. 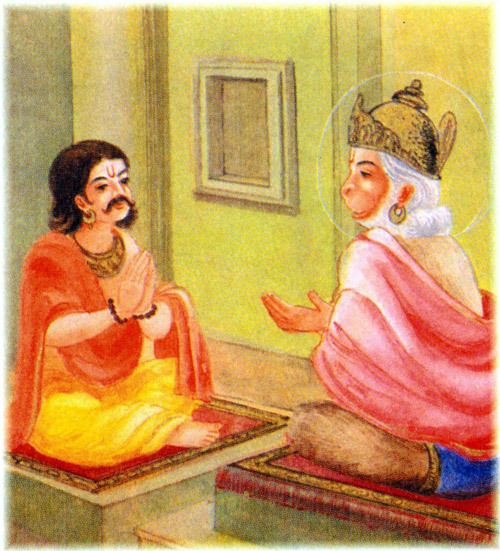 Swami didn't want Bejoy to beg a favour on account of his disabilities. So, He always encouraged him to look after himself. Instead of worrying about the things he could not do, Bejoy learned to concentrate on the many things that he could! (In fact, he even plunged into carpentry and made a few things for the school!) That is Swami’s miracle - He does not always change the external world; He changes our inner world so that nothing is the same ever after. Bejoy saw everything as Swami’s blessing on him, polio included. He accepted the polio as the working-out of his invisible karma. To one with such an attitude of surrender, all disabilities or obstacles melt away. That is possibly the inner meaning of Pangum Langhayate Girim. One day afternoon, Swami came out of the interview room and indicated to the students that he would be visiting the hostel. They had put up some exhibition, and had been praying Swami to grace it. Instantly, all the students rushed from the mandir towards the hostel to secure vantage positions for the Divine visit. Swami asked the teachers also to go to hostel, so Bejoy got up from the portico and began his journey. Of course he couldn’t move as fast as the others. But his energy and enthusiasm were the same. He moved as fast as his crutches would take him. As he crossed the General Hospital gate, he was in for the surprise of his life. An occasion where Swami came to inaugurate a photo exhibition that had been directed and arranged by Sri Bejoy Kumar Misra. A white Mercedes Benz stopped by his side and the vice chancellor of the University, Sri V.K.Gokak, stepped out from the front passenger door. Bejoy turned around to see Swami and Prof. Kasturi in the back seat. The vice chancellor asked Bejoy to get into the front seat of the car! Swami nodded assent. After Bejoy settled in Prof Gokak sat by the door. So now, it was the driver, Bejoy and the vice chancellor in the front seat. Swami was looking at Bejoy, and like a very indulgent parent was worrying how he could manage to keep his crutches. When He noticed His child knew how to carry himself even in this unusual situation, a smile of satisfaction lit up His face. The proceedings at the hostel went as per plan and everyone was happy! At the end of the programme, as Swami was leaving, there was a mad rush towards His car. Bejoy kept out of the crowd and waited for it to disperse. The Divine Father had not forgotten! When He was coming down the hostel steps, Swami called out loudly for the ‘teacher’ he brought with Him. Bejoy again gratefully shared the front seat with the vice chancellor to travel back to Prasanthinilayam, where he was staying with family. 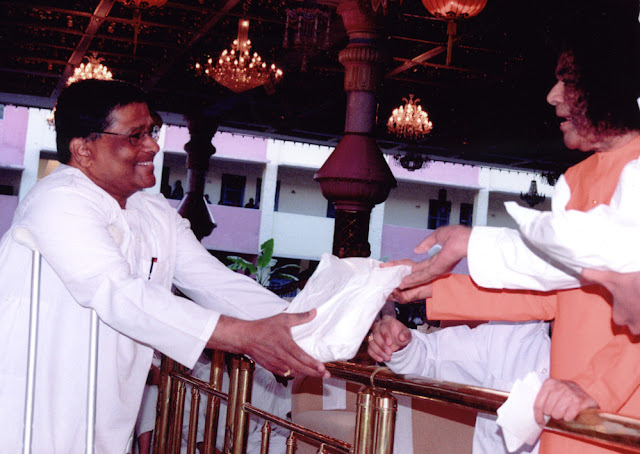 Bejoy continues to teach at the Sri Sathya Sai Higher Secondary School. The students benefit a lot from his English classes. But more than that, they benefit from the life lessons which exude from him. Sairam Aravind tears of joy and awe flowed as I read this part 2 of the narrative, about a day or two after it was posted. Feeling blessde and in bliss. Thank you. Title of the story is very apt . ofcourse you are Swamy's choosen child so whatever you write becomes beautiful ! This story touches my heart as I was born and brought up at Orissa . Mostly people from Orissa are simple minded with strong faith. Bijoy's trust and faith in Swamy and Swamy's love and grace on him and that Hanuman and Vibhishena Story .....waiting for my turn for seva . Not everyone is granted this oppotunity to do seva. Everytime i touch Samadhi at Parthi I pray Swamy to grant me this opportunity. That pining for Swami in itself is enough. 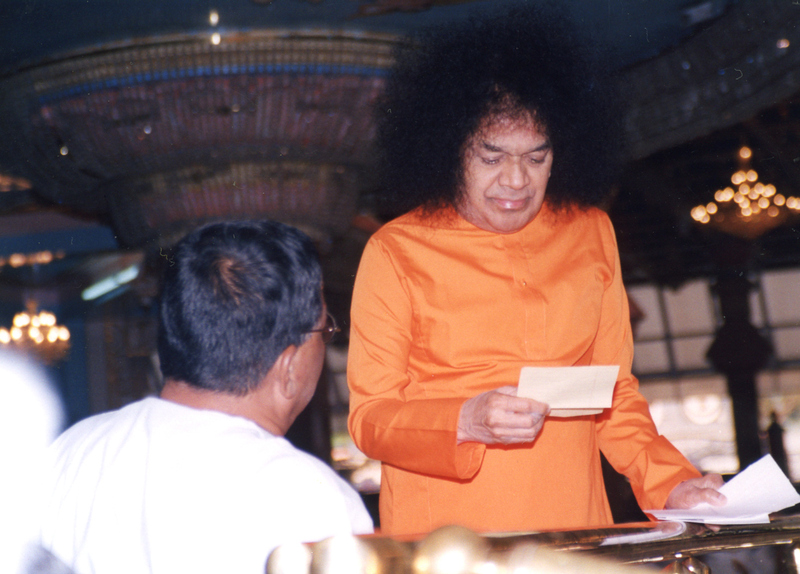 When the time is ripe, I am sure that Swami will give you the opportunity and fulfillment that you seek. May our love for Swami grow stronger every moment. I am very delighted and also experienced the great joy..I came to know the answer, which I used to search and also pinned for it.. This is now reveled from this heart touching episode of bejoy sir. “Oh noble one! You think of (sai)Rama no doubt. But do you do His work? You have love for Him but that love finds fulfillment only when you work for Him. Wonderful indeed, Thanku anna Sairam. That was a revelation for me as well. When we love someone, we have to do something for them at the thought, word and deed levels. May our love for Swami grow stronger every passing moment. It is a boon to know you as a person and read all your articles .It fills me with lot of ananda as if I am in Swamis presence . May you live for 100+ years and ,,,,write write and write and make us all turn right and reach YES YES YES ( SSS) ,Sri Sathya Sai . Is this D Kiran? I know about 5-6 Kirans and so am confirming. Thank you for your wonderful wishes... I feel very blessed and touched. Not just a life story... But an enriching and inspiring encouragement of moral, a code of disciplined understanding of the self and deployment of the same. Thank you Dadei (Uncle Bejoy Misra) for rendering your experiences and Arvind for encountering this extraordinary out of the ordinary. Not just a life story... But an enriching and inspiring encouragement of moral, a code of disciplined understanding of the self and deployment of the same. Thank you Dadei (Uncle)Bejoy Misra for rendering your experiences and thank u Arvind for encountering this extraordinary out of the ordinary.